Saturday was a day of getting things in place for what is to come during Week 5 on Big Brother 2014 thanks to the Veto Competition. The day started a little slow, but it seems like the HGs have a target for Week 5 and it could shock some of them on Big Brother 16! Check out the highlights from Saturday on the Big Brother Live Feeds below in our Big Brother 2014 spoilers! We seemed to get a late start on the day, as the veto players were not picked until later in the afternoon. I thought this was going to lead us into a late night for the veto results for Week 5, but I was wrong. They were at the normal time and we saw Hayden take home the victory this week. Jocasta, again, was in bed and Donny was taking care of her and fanning her. Apparently Jocasta and comps don’t go well together! The HGs were scrambling from this point. It seems like Frankie and the gang want to put Amber up as the renom and backdoor her this week! As exciting as that could be, it is still another female walking out the door. Hayden promised Victoria he would take her off the block because she picked him to play in the comp. Frankie plans on talking to Caleb and getting his approval to put Amber on the block and try to convince him that Amber is using him and not interested and taking advantage of him. If he approves, than backdoor Amber plan in effect. If Caleb reacts bad, then backdoor Caleb plan in effect. My thoughts: what does it matter what Caleb thinks or how he reacts? Why does this house feel the need for everyone to approve in order for a move to be made? Grow a pair, make a move and deal with the consequences. Unless they are all going to split the $500,000 in the end, only one person wins and they need to start making moves to show why they deserve to win. 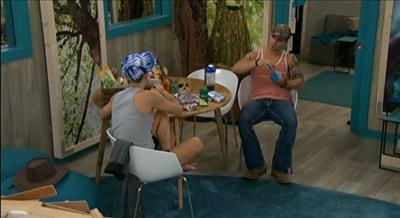 They have the numbers, whether Caleb freaks out or not, to send home Amber. If thats what they want to do (I think it is stupid because Amber is not a threat), then just do it…approval or no approval from Caleb! My rant is done, so now they put Zach to work. He starts working both Caleb and Amber and pitting them against each other. He does good, but this is his speciality. Wreak havoc for his enjoyment. It also ruins his game since everyone thinks he is a loose cannon and cannot be trusted. However, Beast Mode Cowboy “comes up” with the plan to take Jocasta off the block and put Amber in her place. Victoria would go home, but it would scare Amber and she would realize her cowboy can’t save her and all he has done for her in the past was so heroic. The HGs try to convince Hayden to use the veto on Jocasta instead of Victoria, but he said he promised it to Victoria and not going back on his word. He said he would do damage control with Caleb, if need be. All-in-all, these HGs are never sure of a plan. Things could change with a full 24 hours before the Veto Meeting and that could mean ideas change on Sunday. Also, Hayden talked with Donny at some point and was filling him in on everything going on and Zach talked to him briefly about things. If Hayden and Donny could get more support, that would be an alliance I would totally support! Julie Smith, Todd is THE BEST!!! And so is Cat!!! Todd & Cat rock!!! Indeed!! We still need to convince them to move into the house!! Now that would be a season to remember–in a good way, not like the way we remember last season! I considered applying, but then I would miss the summer with all of you! It would be too hard to root for just one of you, you’re both just too liked by us all. It would be a better show if they weren’t so predictable…..when are they going to realize they can’t all win? Hayden, Donny, and Nicole would be a great alliance if they could work it out and actually talk to each other without caring about what all the other HGs think and how they will act. Sometimes you have to get over the being nice thing if you want to win!! Tommy, that is my dream trio also. Plus crazy Zach might be added in–after all, he has already been on the target list! And even tho Jocasta doesn’t do anything, she would definitely never vote against Donny or anyone allied with him. I think you are right, especially if they get rid of his “Queen” this week! I am interested in seeing that more than Amber going home. The aftermath could be good! I agree! Caleb is a ticking time-bomb… a delusional ticking time-bomb. He needs evicted and sent straight to a padded room. I expect Caleb to change his mind about putting Amber on the block. Although it will be too little, too late. Someone so obsessed will not be willing to risk the possibility of having his object of obsession out of reach. All it will take is one nice word from Amber and he will be back to white knight mode. If by chance she does get evicted, Calebs meltdown might make Devins look like a walk in the park. Lets hope it’s entertaining because this season is losing its luster fast. I’m with you Cat! All this indecisiveness is driving me crazy! First they will, then they won’t, then they will, then they won’t…what the heck is going on in the minds of these senseless HGs? Is it just me? Am I the only one confused here? Wow! And “they” say women always change their minds! HA! And no Shirene, you’re not alone. I thought it was just me because I haven’t been on her much today. Hahaha…you cracked me up Cat. Just checking, is this the most recent post and picture from Todd? Wow. I was reading the threads below, and to read the words, “NO BALLS ALLOWED.” That’s a heavy statement even for me. I agree that some of the cast members are playing a terrible game, and don’t even belong in the jury. However, there are some that are playing a good game. I think an alliance with Donny. Hayden, and Nicole is a good idea, but they need to make it happen vary quickly. The longer they wait, the stronger the Detonators get. Right now I have Donny, Derrick, & Frankie as the top players. Amber & Nicole as the top women. I am basing this on game performance alone. I will be watching Hayden & Christine to see if they can continue to win. That was me that said that. How is it a heavy statement? It was a joke. Aimed at what Shirene said. Meaning that no one wants to make a big move this season.